The trial of the POUM in October 1938 is often seen as a Spanish version of the Soviet “show trial.” But it makes more sense to examine it as an attempt by the Republican government to build stable judicial institutions. 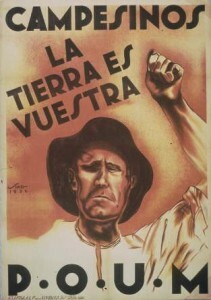 The essay I submitted for the award, “The Soviet show trial as export: justice and legal culture in the Spanish Civil War,” is a chapter in my dissertation, which examines Soviet involvement in the Spanish Civil War through the lens of the “show trial” of the POUM (Partido Obrero de Unificación Marxista) in October 1938. Drawing on Spanish, Russian, Austrian, and U.S. archives, it challenges head-on the interpretation that the prosecution represented a “Moscow Trial in Spain.” Instead, I examine the failed Soviet attempt to export its legal culture to the Spanish Republic and recast the trial as a part of Spanish Republican antifascist politics—a small but integral part of the government’s attempt to build stable judicial institutions and portray the rule-of-law, western, liberal-democratic character of the Republic. The essay sheds light on both Soviet and Spanish Republican legal culture at the height of Stalinist mass repressions. Using a transnational approach, I look at Soviet and anti-Soviet campaigns that tried to influence the prosecution of the POUM. These included actions by both the Comintern and Soviet operatives, as well as by those who advocated from France, Britain, and the United States on behalf of the imprisoned POUM leadership. I analyze “show trials” as communicative texts that provided narratives to mobilize the populace. In addition, I trace the transmission and reception of politics as legal performance and public spectacle. This framework illustrates how high-level Spanish imperatives and transnational campaigns shaped the performance of justice. Ultimately, the essay speaks to several interpretive debates about the extent of Soviet power in the 1930s, western European anti-communism and the politics of appeasement, and the contingencies of late 1938, when Europe was on the brink of World War II and the POUM leadership sat in the dock. Full text of the winning essay in pdf.